Home » Sports » The Drone Racing League just raised $1 million. Is this the world's next sport obsession? One of the world's newest sports is about to take off in a big way, albeit without any spectators on the ground. Or rather so far below on the ground, it's better for them to settle into their living rooms with a screen of their choice. When it comes to spectator sport (sorry chess, not you), you think huge crowds, finger food, drinks and lots of banners and cheering. Not this one. Drone racing is simple. It's drones racing through a track/obstacle where the person finishing first wins. Here's how it works: these drones have cameras attached to the front that broadcast a live video feed to custom-designed goggles that allow their 'pilots' to see where their drones are headed. It's called first-person view (FPV) racing, and a full kit with FPV goggles can now be bought for about $1,000. The drones travel at speeds of 70 mph (112 kph approximately) and have been compared to the pod racing we saw in Star Wars 1 - The Phantom Menace. Tim Moynihan, staff writer at Wired, explains the technology behind these racing drones. It may seem like drones went from experimental technology to intelligence tool to a sport in an insanely short timeframe, but in reality, they've been around longer than we think. What has happened: a sharp drop in prices as component prices fell, making drones easily accessible to hobbyists and enthusiasts. It was only a matter of time before the leap from hobby to sport was made, and not just in one part of the world - they're racing drones underground in Melbourne and in forests in the UK, in abandoned parking lots in Paris and all manner of locations in the US. And back in July, the first sign that this was turning into a more formal 'sport' came when drone racing had its first 'major' championship, the national drone racing championship at the California State Fair in Sacramento, US. People who like video games. And people who have a passion for flying. 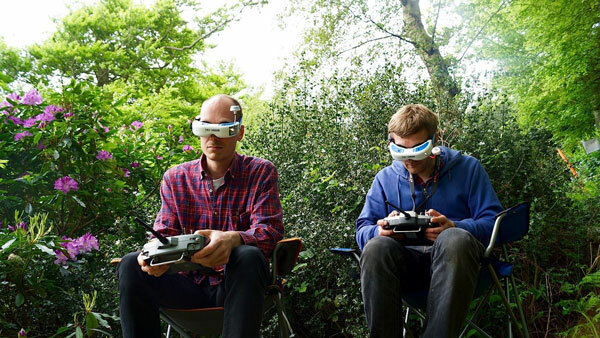 Because drone racing seems to combine these twin passions into a heady new experience. From all accounts, it's immersive. And addictive. "When I put those goggles on I'm in a completely immersive space where I cannot think about anything else for a few intense moments," said Dom Robinson, a racer from Brighton in an interview with ArsTechnica recently. Another racer, Matt Denham, told the site that it puts you in "an entirely new dimension with your surroundings. It's about as close to being a bird as you can get." There's no argument that this is still a nascent sport - new enough that calling it a sport may feel mildly premature. But the first essential for the founding of a new sport exists - passionate enthusiasts, and this drone racing already has in pretty amazing numbers. What it needed next to organise itself was funding - and that came through back in August. One of the organisations springing up around the sport, the Drone Racing League, announced that it had received a $1 million investment from Miami Dolphins owner Stephen M Ross. A 75-year-old billionaire, Ross already invests in soccer and has now teamed up with Drone Racing League's 34-year-old CEO Nicholas Horbaczewski to see where the hobby-turned-sport can go. Horbaczewski isn't yet ready to talk details. He acknowledged media reports that the races would be similar to video-game competitions but indicated that unlike the former, these would happen in large arenas. The first major event is being planned for early next year, and rules are in the process of being formulated; hobbyists, for instance, race whatever drones they like but the League will require all drones to be built to the exact same specifications to ensure a level playing (air)field. There are tonnes of issues to resolve, among them quite simply who gets to set the rules, and how it can be turned into a more effective live spectator sport: at the moment, someone watching live doesn't know how to distinguish one drone from another, so is unsure who they're cheering for. There are technical challenges too; at the California State Fair, some drones couldn't take off due to a lack of signal - only eight drones can race together - because the current technology developed for FPV is limited. Another challenge: the feeds from the drones that were put on a jumbotron were low quality. This was to make sure that racers don't get motion sickness from an HD stream that would invariably lag and often cut out. Interest from participants is high but from spectators is slow. The California State Fair event, for instance, saw only 60 people turn up in person - but over 1,000 people were tuned into the livestream at any point of time, from over 126 countries. More recently, on November 7, the International Drone Racing Association held its first championship in the Los Angeles area, the California Cup. Several hundred spectators turned up and stood behind the nets inside a hollow building and watched as racers competed. 2015 has been a defining year, not only for drone racing but for drones in general. Consumer Electronics Association reports in June predicted that the US market for consumer drones would reach $105 million for 2015. That itself is up 50% from 2014. There's a few key issues to resolve though. The first is, quite simply, acceptance in the public eye. Reports of drones flying over private spaces have already prompted a backlash. Then there's the debate on whether drone racing should be held in a large indoor stadium or outdoors. Outdoors, it can be affected by climatic variations; indoors offers restricted space. Outdoors, more chance for spectators to feel free and cheer and participate as the 12th man. Indoors, spectators will have to sit on the outside of a glassed-in room, for safety reasons (at least in the current scenario). And then there's the simple reality is that until money flows in, it will remain a hobby - however passionate, no-one's quitting a day job just yet. Is the future of drone racing online? The answer may well be yes, at least in the short term. Many racers have and continue to prefer recording their drones performing acrobatics using a camera, usually a GoPro, mounted on top. Best moments are then edited into a high-resolution video, aided with music and posted on YouTube and social media networks such as Instagram, Facebook and Twitter. That ends up making for far more compelling viewing as demo-ed by YouTube views, some upward of 500 million. 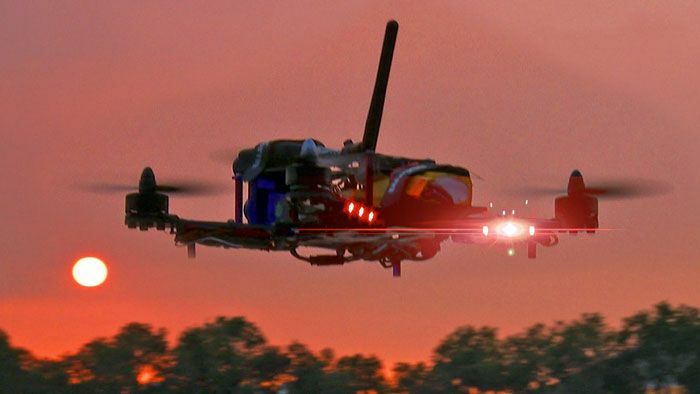 Once a live high-definition video can be captured and broadcast from the drones without any lag, enthusiasts are certain spectators will begin embracing the world of drone racing in droves. As Scot Refsland, the race director for RotorSports told the New York Times, "We hope it will look like a full-on, high-definition Nascar event." What 2015 has shown is that day is likely to come sooner than any of us think.